The judge symbolizes justice, fairness and balance. 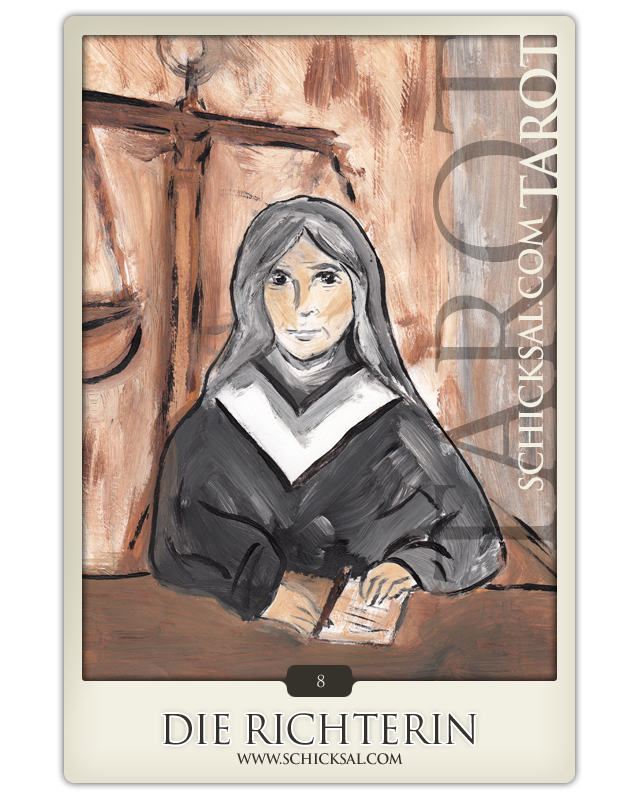 The tarot card the judge shows a woman of public law. She sits behind her lectern and looks at the viewer with a steady gaze but she regards with favour. In the background you can see scales of justice. The judge symbolizes justice, fairness and balance. It makes clear that everyone is responsible to assume responsibility for its action accordingly. Every single action in the past has an effect on the future. Whatever you did say or did do has its consequences for the current situation. The judge makes you aware the connection between former events and recent events. It is asked for critical consideration. How a story will end it lies in your hands. A decision should have made by thinking over – with regard to all facts. Fairness represents the focus which should have taken into consideration after responsibility towards others. It should not be treated too hard but mistakes are human – the significance means what learnt from. It is a question to search for the truth concerning tolerance and balance. It does mean to say sorry one day and it should be proved with consideration of humility, severity, harmony and confrontation. However, everything has got both sides now and it is given the advice to balance opposites. In case of a current conflict this conflict maybe can be solved meanwhile. In negative sense it let you see clearly now to regard hurts with humility and forgiveness.to become intolerant and self-righteous or develop excessive severity. During this periode people tend to see all black or white. It is left out of consideration to think over personal response. The judge asks for tolerance, fairness and a behaviour or treatment that is always desirable. By the way now it should be in the centre of thoughts and in mind to act and react well considered and show more leniency. First it should be regarded as well to consider the appropriateness of the past and the future. Now the time has come to verify the technique in a pragmatic way by moral values has great significance. If we act in a false way the result could have failed. Existing problems with colleagues should be solved by dealing fairly. Today it is the perfect day to solve problems. The judge asks for reason and objectivity. Behave fair and correct in a friendly way and by the way the problems could have been solved.